Generation Mum: A brand new mum! I admit I am guilty. Guilty of loosing my patience and yelling at my dear child after he's ( fill in the blank) or (fill in blank 2). Suffice to say I've yelled at my baby more often than I would have liked. I have noticed that the effectiveness of my yelling at him has decreased so much so that he no longer reacts unless if I raise my voice louder than I had previously. This creates a huge problem for me because unlike a speaker I cannot tune my voice up or down with the turn of a switch and even speakers have a noise limit. Something must be changed. I was thus inspired to 'quit' yelling, cold turkey because I was just sick of the current method of parenting and I felt that R and I both deserved better. 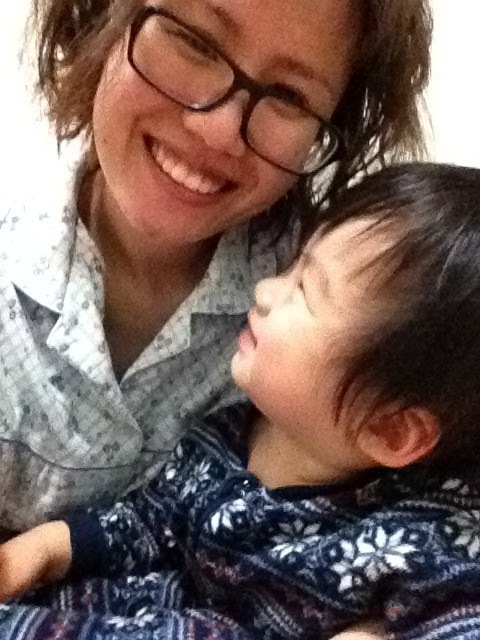 An article from Parenting (Taiwan) gave me the necessary motivation to change. It is about how 400 days of no yelling changed the relationship of not only a mother and her child but also her relationship with herself. Here are a few points that age mentions which, I have to say, she makes a darn convincing argument! 1) You can sleep better at night without the guilt of today's yelling episodes on the back if your mind and the sound of your child screaming back 'I hate you mum' ringing in your ears. 2) You should always remember that your children are your most important audience ( not the strangers on the bus or in the supermarket). What they think of you is the most important so remember that next time a vein snaps. 3) Children are people too, it's unreasonable to expect them to always do the right thing or to follow your orders. How would we feel if every time we made a mistake somebody yelled at us? 4) You can't control your child's actions, but you can control your own. Even adults can't always follow directions down to a tee so why should we force our children to? Rather than yell until your voice breaks why not go to another room and give yourself a time out before trying another way of communication? 5) Screaming senselessly is only, well senseless, plus the child probably has no idea what you are going on about anyway. 6) Don't pass on any opportunity for bonding. Even if your child should be in bed but is instead next to you they could just be wanting to give their mummy a hug or a kiss good night! Yelling 'why aren't you in bed' not only deprives you of a affectionate moment but also leaves the child hurt and heart broken. 8) Most of the time the problem isn't even the child, it could be you! Maybe you need a time out? A well deserved spa or massage? Get someone to babysit so u can have some me time and your child gets a happy mummy instead of a grumpy mummy. 9) Remember that everything is within your control, you are the adult and you are your child's best teacher on how to control their emotions!